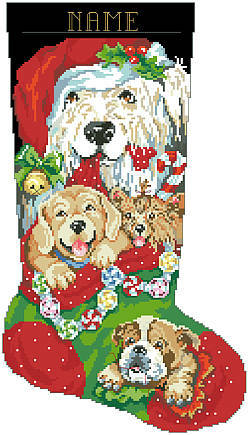 Soft and oh-so-huggable, these cute, cuddly puppies are sure to attract the attention of Santa! This piece would make a great gift for any dog lover or beloved pet! Includes a full alphabet for customizing your family name. Contents: Stitch count 123w X 217h, Finished size on 14 count: 8-3/4" X 15-1/2"